Possibly one of the lightest pair of shoes which we have tried on, these minimalist running shoes are great for running and for parkour as well. They are made for barefoot runners, and the close contact of the foot to the ground provides an overall feeling that nothing is standing between your feet and the ground when you put these shoes on. Each shoe weighs a mere 8oz which is possibly the lightest sneaker out there and is made by the famous brand Vivobarefoot. 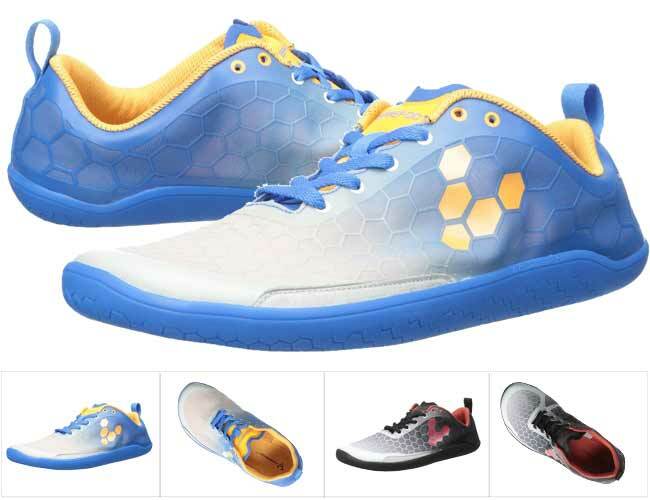 Apart from the lightness, what makes these sneakers perfect for parkour are their outsoles with a unique V Multi 2 coned hexagon pattern design providing an incredible grip, especially on rough surfaces, such as concrete or asphalt. Grip of course is very important for staying safe and performing well while performing parkour. What is even more important is that these outsoles are actually quite hard to pierce and are in fact unbelievably durable despite their light weight and construction. The light V Web stitch-less upper provides a snug fit to keep the foot in place, and yet there is sufficient toe space, so that toes are not cramped during running or training, and so they can spread for better balance. The Neos are great for wallruns, and precisions and landings are just like barefoot ones. So, if you have been training with barefoot or with minimalist shoes, you will surely appreciate this model. The very spacy toe box could need some time for getting accustomed to it, especially for parkour tricks. They have excellent breathability, moisture management and odor control. Overall, these barefoot running shoes are extremely lightweight, with almost no padding and offer a nice grip especially on rougher surfaces. The outsoles are high quality, difficult to pierce and are durable. All of these features make them great for barefoot or minimalist parkour enthusiasts.